Enjoy a raw fish breakfast by marinating fillets overnight in lemon juice and seasoning to ‘cook’ the proteins. Super easy and full of healthy amino acids. Fish makes a delicious breakfast. It is also a good way of making sure you get the recommended 2-3 portions of oily fish a week. Unfortunately, fish is very perishable and does not keep well, even in the refrigerator. This is because fish swim in very cold water, and so need to be kept at 0°C to remain in peak condition. The ambient air temperature of a refrigerator is closer to 5°C, so is not cold enough to slow down the enzyme activity that causes decay. This is why fish is stored on ice at a fish counter. Because fresh fish needs to be eaten on the day of purchase, breakfast dishes traditionally rely on the use of smoked fish. Think of the classic combinations, like scrambled egg and smoked salmon, or the curried rice and smoked haddock dish kedgeree. Smoked fish has a much longer shelf-life than fresh fish, because the smoking process removes moisture from this fish, which the slime-producing bacteria need to reproduce. 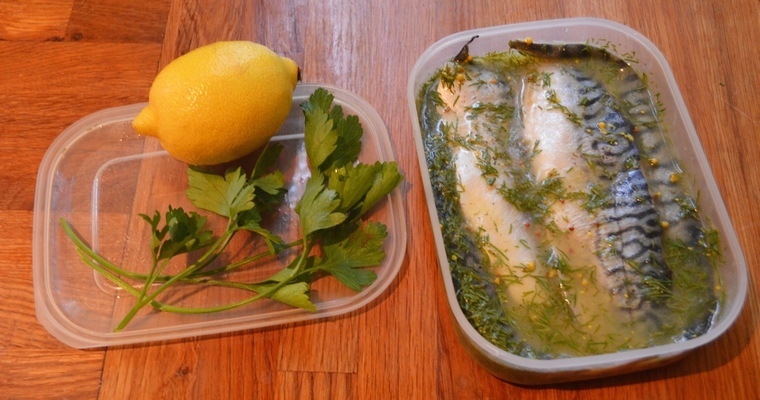 Another way of preserving fish can be done at home by soaking in an acidic liquid. This slows down spoilage by creating a hostile environment for bacteria. Marinating fish for more than 30 minutes irreversibly alters the texture of fish, causing the protein molecules to denature and unravel. The denatured proteins then bond together, giving the flesh a firmer texture and opaque appearance. This is the basis for Ceviche, a Peruvian dish where fish is marinated in lime juice, oil and seasoning for several hours before being served raw. This method of ‘cooking’ fish means that healthful amino acids are not destroyed by heating. The fish can be kept in the refrigerator for 2-3 days in the marinade, which makes for a super convenient breakfast. Do please make sure you buy the freshest quality fish – tell your fishmonger what you are intending to do with it, so they can advise on whether they have anything suitable in stock. This may mean searching out an independent fishmonger rather than relying on a supermarket fish counter (possible they are just overly cautious, but they don’t seem confident about eating their wares raw). And, as a general rule when it comes to fish, try to limit your intake of large fish. These are higher up the foodchain, and so accumulate more harmful toxicity. So enjoy marinated salmon as an occasional treat, but in the main stick to whole-sized fish such as mackerel. Once you’ve eaten your fish, do not throw away the marinade. This can be kept in the fridge and mixed with olive oil for a tasty salad dressing. Put the lemon juice, dill, mustard and salt into a non-reactive container such as a glass or ceramic dish, and mix until blended using a whisk. Add the fish and ensure that it the pieces are completely covered by the juice. Put the container into the refrigerator and leave for at least 12 hours (I prefer the texture from 24 hours onwards). Once the fish has marinated for at least 12 hours, it is ready to eat. For best results, eat within 2-3 days. To serve, drain and transfer the fish onto a dinner plate. Add the poached egg to the side and create a mound of rocket leaves. Top the rocket with the walnuts and avocado. Blend the olive oil and marinade in a mug using a mini-whisk or teaspoon, then drizzle over the rocket. Season the whole lot generously with black pepper.